Compassion in Action will once again be delivering toys and hampers containing fresh produce and essential food, toiletries and cleaning products over the Christmas period. On the 23rd and 24th of December, we will be delivering a total of 219 hampers throughout the Wigan borough, to those experiencing hardship at Christmas time. We intend for our hampers to address health and well being issues, enabling the most vulnerable to have access to nutritional food, and essential toiletries and cleaning supplies. 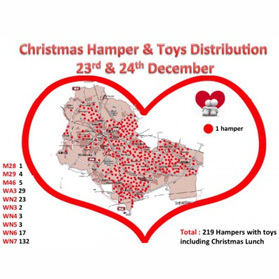 We hope that our hampers will go some way toward easing some of the burdens that Christmas can bring, with inclusion of toys and a Christmas Dinner meal.